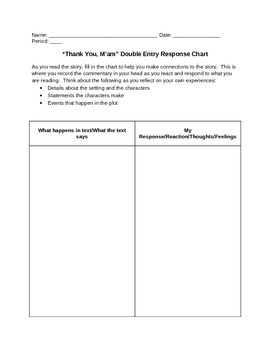 Use this double entry response chart to help students relate to the events and experiences in Thank You, Mam, a short story by Langston Hughes. Intended to be used during reading as an active reading strategy, it helps students to think about what they are reading so that they comprehend the story better. Great as a readers notebook entry, discussion starter, or a stand-alone assignment. This document is also available in the Thank You Mam All-in-One DEAL.